Richard Gere is playing cover over his reported marriage to Alejandra Silva. Multiple outlets confirmed earlier this week that the 68-year-old actor and 35-year-old Spanish socialite have tied the knot. 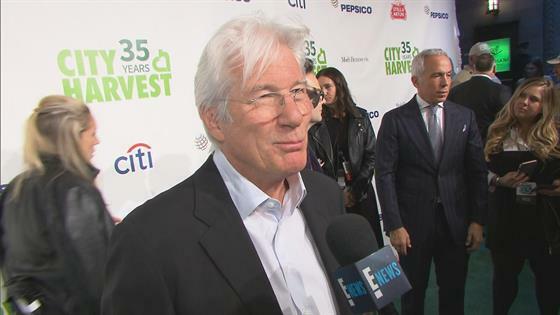 But Gere didn't appear to be wearing a ring during to his interview with E! News at the City Harvest 35th Annual Gala on Tuesday night in New York City. While talking about the event with us, Gere wiped his face with his left hand, which didn't have a wedding ring on it. At the end of the red carpet interview, he told E! News that the wedding ring is "invisible." The couple first sparked romance rumors about three years ago. E! News confirmed in June 2015 that the couple was indeed dating shortly after they were spotted packing on the PDA on a yacht off the coast of Acitrezza, Italy. A source told People on Monday that Gere and Silva married "weeks and weeks ago" and are "extraordinarily happy." "They're so comfortable with each other, have fun together and are looking forward to their future together," the insider also added. Gere and actress Carey Lowell separated in 2013 after 11 years of marriage. Their divorce was finalized three years later in 2016. Gere and Lowell have one son together, Homer. Silva is divorced from Govind Friedland, with whom she has a son, Albert.